 EASY AND CONVENIENT ➜ Our cabinet locks are so EASY TO INSTALL with no tools at all. Peel the film; stick it on and your all set with our child safety locks . If your drawer has something to hook on to, you don't even need to stick on the provided catches. Cabinet Locks Child Safety!  NO KEY ➜ These baby safety cabinet locks for your child require NO KEY TO OPEN the locked cabinets. No worries about loosing keys. The easiest way to baby proof your home! No need for magnetic latches on your door.  UNIVERSAL FIT ➜ Supplied with catch and latch, virtually ANY CABINET, DRAWER and CLOSET can be made baby safe. And your furniture will be left undamaged when it's time to remove the baby proofing drawer lock. These baby locks and fridge lock for child proofing will work on almost anything.  INVISIBLE DESIGN ➜ These locks are designed for the inside of drawers and cabinets which will not get your curious baby's attention or destroy the beauty of your furniture. baby proofing cabinets have never beed so neat. some child proof cabinet locks will have your home looking like a kids playpen. 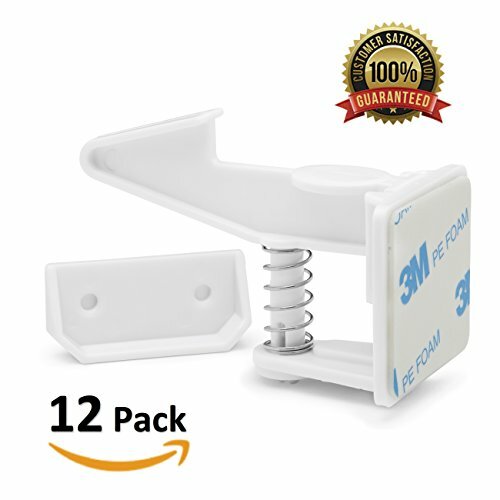  PERFECT BABY SHOWER GIFT ➜ These drawer locks child safety locks make for a great baby shower GIFT or new baby present. New parents will be prepared when their infant begins crawling. child locks for cabinets are a necessity in every home.